Home > tecmo > E3 2017: Nintendo, where the hell is Lyn in Fire Emblem Warriors? E3 2017: Nintendo, where the hell is Lyn in Fire Emblem Warriors? Fans were generally happy with Nintendo's showing at E3 this year. After all, multiple "core" Metroid games, the confirmation that a "core" Pokemon game was in development for the Nintendo Switch, and an all-new, hyper cute, Yoshi game were always going to be enough for anyone with a soul. Did you notice the same thing missing that I did? There are a large number of characters from previous Fire Emblem titles depicted in the trailer, as we know would be the case. The point of the game is to bring together heroes from the entire franchise, after all. But where's Lyn? Lyn is one of the most popular characters in the entire history of Fire Emblem. She was voted as people's favourite character in the recent Fire Emblem Heroes poll. She is especially important to the series in the west, as she was the first "Lord" character that we ever got to control in an officially localised Fire Emblem game out this way. And most importantly she's a genuinely great character. Fire Emblem fans have been assuming that she would be part of this game's cast since day once, but taking into account the fact that Nintendo and Tecmo would know that she's so in demand, her lack of a reveal so far is starting to seem ominous. Related reading: Dear God does Lyn look good in a bridal gown. There are potential issues with having Lyn in this game. 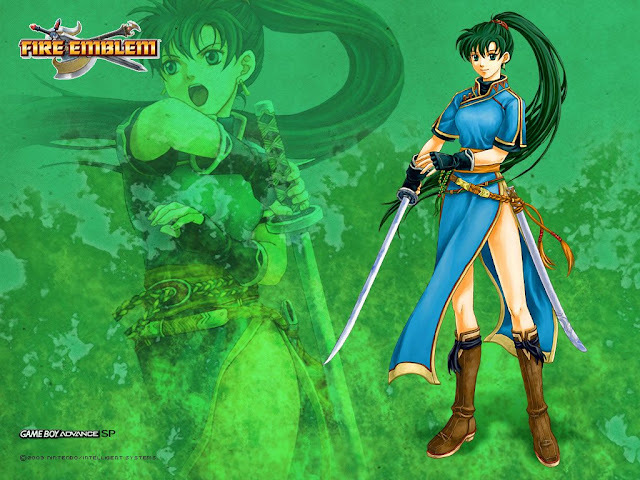 Lyn's costume in the Fire Emblem games is a "Princess Leia slave"-style dress, with a front and back, but huge slits on either side to display her legs. In static images - such as we see in Fire Emblem and Fire Emblem Heroes - this dress is perfectly fine, because it's possible for the artists to simply draw it so it conceals the important bits. But in motion in an action game... well, play a bout of Dead or Alive with Kasumi and her default costume, which is similar in design, and just count how many times you see her underwear as she moves around and fights. Nintendo may well be concerned by this, and unwilling to actually change Lyn's costume, knowing full well how many Internet cry-babies would stamp their feet and scream "censorship" at any efforts to preserve Lyn's modesty. Alternatively Nintendo might be holding the character back as a DLC, and that would be a little disappointing in itself. Not that I wouldn't buy the game and the DLC to have her, but I had been hoping that Lyn would be one of the central characters to the game's narrative, and that's seeming increasingly unlikely. So, yes, where the hell is Lyn, Nintendo?